Have you ever walked into a store, had your eyes light up, and involuntarily you let out a little… “Woooow!”? That’s what it’s like to step into Potters Christmas Store in Surrey, the 28,000 square foot greenhouse which has become the largest Christmas store in Western Canada. 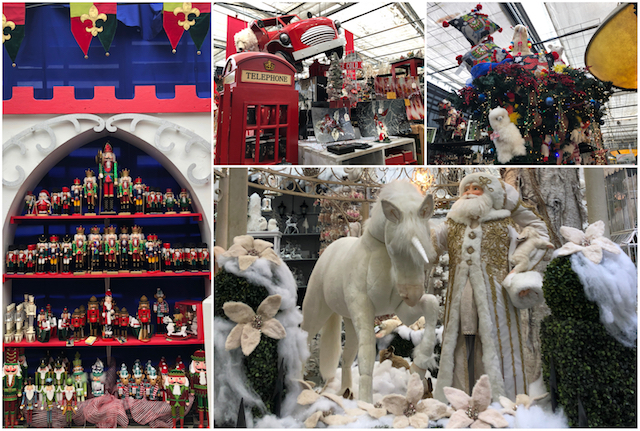 For nine weeks a year, Potters transforms this garden centre space into a holiday wonderland. Greenhouse benches are moved out and store fixtures are moved in, along with everything Christmas. Santa’s workshop is readied and the lights in Santa’s House are turned on. They shop the world for all things Christmas so that you can find everything you need in one place. Their line of themed ornaments covers everything from fishing to skiing to baseball to equestrian and then some. They have an entire showroom dedicated to Christmas lighting and home décor — including a full-size leg lamp, just like in A Christmas Story. 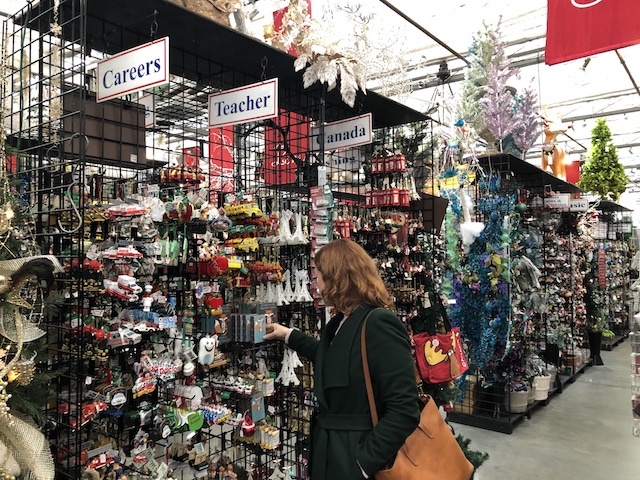 They also carry an extensive line of decorated garlands and wreaths, pet-themed ornaments and decorations, nutcrackers, personal care items and more. Not to mention games, gift items, a clothing and jewelry boutique, and over 200 stocking stuffers. For the foodies, the Gourmet Food area has been expanded with fun new items, including SpiritDust (add just a pinch to your holiday drinks to add colour and glitter), flavoured popcorn in 10 flavours (including Cookies & Cream and Apple Pie), 30 flavours of hot chocolate, “Cookie Bits” hot chocolate topping, and much more. I will draw one winner at random from all entries on Friday, November 23, 2018 at 12:00pm. Follow Potters on Instagram and Facebook for more info. Update The winner is Kim! Hey there – gonna head down to Potters.. one stop shop for hard to buy for people! I hope there is a train! What a fabulous store Potters is. It has beautiful Christmas items. Thanks for the great contest! Potters is a great store. Year round they have wonderful gardening items and this time of year with Christmas their store is so magical. Merry Christmas!!! Wow, this place looks amazing! Have never been and would love to go and find some Christmas decorations. I would love to shop at Potters Christmas Store. They have so many interesting items! I lose hours in Potters browsing. What a wonderful way to make the best use of seasonal space! I’d love to shop here and buy some decorations for my family! This is my favourite place to get Christmas ornaments. Beautiful store. Potters is always decorated so nice at Christmas. Our family love to go to the shop and see the elves!!! We always stop here at least once during the xmas season! Always take a peek at Christmas time. Merry Christmas to everyone! Tis the season! ……to shop! Would love this! I can’t wait to check this store out! We go to Potter’s every Christmas. The kids pick out an ornament each. I love shopping at Potters during the holidays. I can’t believe I have never been to Potters! I mean to every year. This has to be the year! Great prize to get ready for Christmas. The way Potters decorate their space for Christmas, it’s simply magical! Thanks for offering up a $100 gift card. I love Potters! Pick me!! Wow..this is such a magical display! Would be fun to win $100 to splurge on these beautiful decorations/ornaments! Thanks M8ss604! Thirty flavours of hot chocolate?!? Yes please! My mom and I would love to go out there for the day! I love the Potters Christmas Store! That would be very helpful — we need to update some decorations. I have not been to this store before. It looks amazing! What a wonderful incentive to be introduced to it. I LOVE Christmas, but my husband is a scrooge.. As i cant justify buying christmas decorations this would be my ultimate dream. Thank you for the chance. I could use really use this. I love Potter’s, you never know what you are going to find, and you will find something for that person that has everything and is hard to buy for. We go to Potters Christmas store every year! We love going. I am definitely going to go check out Potters this season. It’s been years since I’ve been. Thanks for the reminder. Me and the kids always look for one ornament to represent an adventure or significant activity that happened that year. Every time we put up the tree and we put ornaments on, we always get to reminisce about adventures in our lives together. I’ve never been to Potter’s, but it seems so darn cool! My fiance is obsessed with Christmas (really), and I’m sure he’d love this place! We go to Potter’s every year. Luckily we have time off during the week so it’s not as busy as on the weekends. I remember coming here before. It’s such a cool store! I love Potter’s! It’s like a magical Wonderland during the holidays! I’ve always wanted to go there, we’re moving so will clearly need all kinds of new Christmas decor! Starting to feel a bit like Christmas! I would absolutely love to go shopping at Potters! Christmas is my favorite time of year! Would love to win, Potters is a favourite!! Love Potters. Take my son every year. I could easily spend this prize before Christmas! I love the Potters store all year round but Christmas is very special!! Potters is a magical and amazing place! My girls would LOVE to come explore this Wonderland and see 🎅!!! Wow, what a great contest! Would love to check out Potters! Potters is the best Christmas store around! Thank you thank you thank you! My mom would love this! So many amazing and beautiful Christmas decorations! Yes please! Love that store! Could get a nice wreath this year! Yes please!! Could use some beautiful ornaments! Cant wait to go shopping for our annual ornament tradition. Potter is the best Christmas store. $100 in a Christmas wonderland? Yes, please! I’ve never been to Potters but I would love to go check it out! This sounds amazing! I could use some ornaments. Thanks for the chance! Potter’s is a magical place! Love this store! What a great prize. I will have to go and check this store out, looks like a lot of things! This store is amazing! Always able to put me in the Christmas spirit!